Although developed from different origin, Mini Lop rabbit appearance at a glance is similar to Holland Lop, but a bit bigger, more hairy and the ears are down to earth. They also have more varieties of colors – we can say all colors available in rabbits. Initially big-size German Lop and small-size Chinchilla were cross-bred in Germany to produce new type of rabbit called "Kein Widder" rabbit in local language. From there then brought to US and developed further to become current Mini Lop we know. No wonder Mini Lop is very popular in US until today. 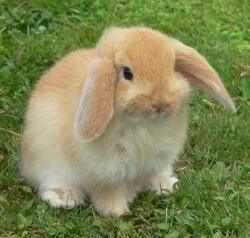 Maybe because of its origin, sometimes Mini Lop also called as German Lop, although both of them are different breeds. With weight between 2 – 2.5 Kg Mini Lop is considered as small rabbit. By the way, in UK and Europe there is known also another different breed of small Lop rabbit – slightly bigger than Mini Lop – called Dwarf Lop. They were developed in Holland from French Lop. Mini Lop bunny, sweet and calm. In general, Mini Lops are usually sweet and calm, smart and intelligence pet rabbits, for example they are reported as easily litter box trained. Less active but can be playful. And because the sizes are small too, make them very suitable pet for children.